Here at The Long Riders' Guild we are frequently contacted by would-be Long Riders who are looking for help and advice. So we were all the more surprised to receive this email from South America from someone who had studied our website but waited until he qualified as a Long Rider before contacting us! When I decided in April 2004, to realize my dream and to ride from the south of Argentina to Costa Rica, I encountered after some hours on the Web your website. The information and reports of the journeys have motivated me additionally to start the ride. We had horses on the parental farm in Switzerland. But to ride twice a week for some hours can not be compared with a Long Ride, and I started into this adventure as a greenhorn. Meanwhile I learned much, on the one hand handling the horses and on the other hand the country and people in Argentina. With my two best friends (Corazón and Torito) I made meanwhile already nearly 4400 kilometres, after we started on 9 February 2005 in Rio Turbio (south-west of Patagonia). 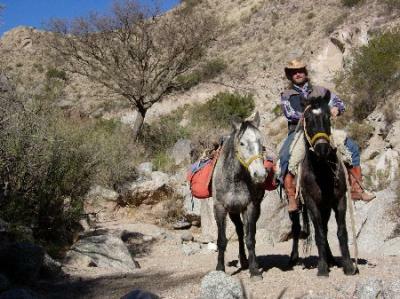 For the first 3 months I was accompanied by my brother and his two horses, Poroto and Mano Fino. After the winter break, Erich decided do not continue the ride and so we (my horses and I) started the second stage on 15 October 2005. In January I decided to make a break of 3 months, the horses had no more fat reserves after the long and hard winter in Patagonia and the two needed time to recover. On 18 April of this year we started the 3 stage, recovered and with reserves. At the moment we are having short holiday and will start the last stage for this year. This stage will bring us at the end of September to the Bolivian border. Afterwards, after 2 years sabbatical, I will search a work activity and plan to continue the ride in 2008 to Costa Rica. Naturally with my two best friends - Corazón and Torito. Recently a Gaucho said, “You must be a patient person.” And I think, this is correct, because a horse journey does not have anything to do with hectic daily life, to which many humans are subject and where everything would have had to be done already the day before. To travel with horses depends too strongly on the condition of the horses, to the difficulties of the way and the possibility of finding fodder and water. The person who can find this peace or already has, will enjoy travelling with horse. André has ridden more than 3,000 miles in South America. As he said in a recent message to The Guild, “this corresponds to the distance between Gibraltar and Moscow via Amsterdam, or New York to Los Angeles." Although we have not heard from André for many months, it seems from his website that he has completed his ride. For more information, please visit André's website.